Die Linke’s Sahra Wagenknecht is wrong about refugees, borders, and police. But don’t give up on the party just yet. Thanks to party leader Sahra Wagenknecht’s controversial statements on domestic security and refugee policies, many antiracist activists have declared that they will not vote for Die Linke in the upcoming election. Some are leaving the party altogether. The anger is justified. Wagenknecht blamed recent terror attacks on German chancellor Angela Merkel, complaining about an “uncontrolled border opening” and police force downsizing, in quotes that bear similarities with the political language of the right-wing Alternative for Germany (AfD). But given the current political situation, abandoning Die Linke because of disagreements with an individual member, even a very prominent one, is the wrong political response. Die Linke represents a significant historical development: for the first time in over fifty years, a sizeable, pluralistic, socialist party is enriching German politics. It has brought anticapitalist perspectives to parliament and the mainstream media. The party’s platform and an overwhelming majority of its sixty thousand members make clear distinctions between left and right. In an increasingly nationalist climate, they support open borders for anyone and everyone in need. Since rising to prominence, Die Linke has massively increased resources for social movements and critical scholarship. The party’s clear anti-Nazi and pro-refugee stance, its anti-neoliberal and pro-welfare platform — not to mention its solidarity with the struggle in Kurdistan and its opposition to Germany’s bloody deal with Turkish president Recep Tayyip Erdoğan to keep refugees from entering the European Union — have made the party an important partner for many activist movements. In light of the far right’s ongoing global resurgence, throwing this away because one prominent representative made public statements that some activists will not tolerate cannot be considered an appropriate response. Even Wagenknecht’s harshest left critics agree with 80 percent of what she regularly says. Her appearances on major talk shows have made her the most important voice against neoliberalism in Germany today, reaching millions of people who would otherwise not be exposed to left-wing ideas. For this the Left owes her a debt of gratitude. That said, we should not accept how she’s trying to win over voters drifting toward the right-populist Alternative for Germany. In doing so, she has opportunistically adopted its language, rather than taking a principled stand against racism. Her comments on “the rights of guests” and “capacity limits,” her claim that Merkel’s unwillingness to close the border partially caused Berlin’s recent terrorist attack, and her call for more police sound more like AfD — and, to be fair, most of the political establishment’s — arguments than they do like Die Linke’s platform. Until now, the party’s position on these issues has made it unique. Die Linke supports refugees and open immigration policies, saving its criticism for the billions of euros spent on bank bailouts, the unjust international distribution of wealth, and Germany’s arms exports, which fuel the kinds of conflicts that force people to flee their homes in the first place. The party must continue to uphold these principles. Bernie Sanders’s impressive presidential campaign demonstrates how we can connect the economic issues affecting workers and the unemployed with an antiracist and antisexist platform. The German left must also link struggles against exploitation with struggles against oppression. Anyone who wants Die Linke to stick to its current position on refugees and so-called security policies — whether as a party member or as a critical sympathizer — should get involved in the fights around the party’s direction, not walk away. 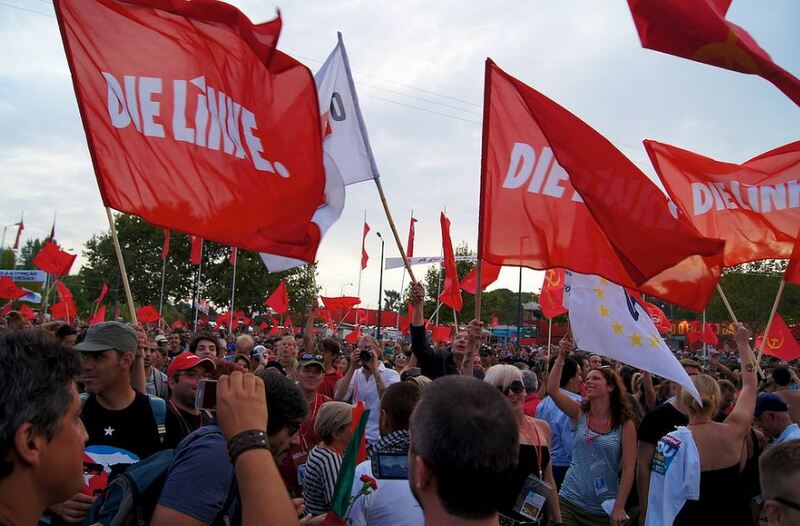 Boycotts, electoral abstentions, and public resignations against Die Linke — currently Germany’s most important bulwark against neoliberalism, racism, militarism, and the new right — are counterproductive. The debate over the party’s future and the challenges it faces shouldn’t be abandoned so quickly. After all, weakening the Left will do nothing to help us fight the Right. Republished from Neues Deutschland .